Its Chechen side Terek Grozny who lead the Russian premiership after handing Dynamo Moscow their first defeat of the season. 1-0 was the final score in Grozny. The only goal came 13 minutes into the game after a free-kick. The cross was dealt with poorly by Dynamo's defence allowing Timur Dzhabrailov the chance to pounce. The Grozny side now tops the league, though second place Kryla Sovetov and Zenit could overtake them on Sunday, when they play Lokomotiv and Tomsk respectively. 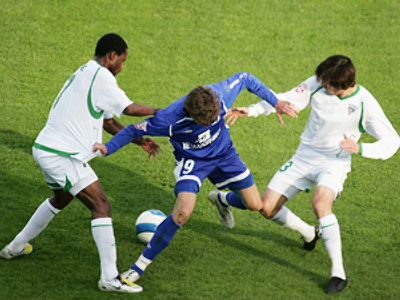 Defending champions Rubin could have overtaken Terek, but were held to a scoreless draw in Kazan by visitors FC Moscow. The Muscovites’ Belarusian goalkeeper Yury Zhevnov held his ground well, not letting energetic striker Aleksandr Buharov take advantage. It was a second scoreless draw for the champs in row and the third game out of three without goals for FC Moscow. While bottom of the league Saturn were looking for their first win of the season. Their clash against Kuban ended 2-1 with Dmitry Kirichenko netting both goals for Saturn.